Congratulations on making the significant change of quitting using your drug of choice. Right now, I hope you are feeling a great sense of accomplishment, as well as renewed energy from living better with improved eating and sleeping habits. Making this initial change might be the hardest part of your recovery, but this will not be the only challenge you face. At some point, your newfound sober energy may turn into emotional fatigue, and that will be the time you may be most tempted to fall back on negative patterns of thought and behavior, up to and including choosing to use again. This blog is about what triggers and urges you might face, and how you can plan to manage them without giving into relapse. Excessive use of alcohol and drugs may have worked in the past as a short-term escape from unwanted emotions, thoughts, and memories. Now as we approach a new life without substances, these feelings that were previously numbed are not only still present, but are now demanding attention without the crutch of intoxicating chemicals. This will feel weird and be uncomfortable, but it is part of the recovery process. Your goal remains simple: don’t use. This can be frustrating, but it is not unbearable, and to catastrophize these feelings only makes coping with urges that much more difficult. Where is it written that we are entitled to feel comfortable at all time? Nowhere, expect maybe in our heads. This is an irrational belief that can be easily disputed. Discomfort is admittedly unpleasant, but it can be tolerated or even overcome by using relapse prevention planning and rational thinking. The discomfort is also more tolerable when we have a sober support system that helps us get through difficult periods. There is a saying in recovery circles, “Do the next right thing.” I strongly recommend attending support groups. There are hundreds of Alcoholics Anonymous meetings in and around Chicago from early in the morning until late at night. There are also other support groups that have daily or weekly meetings in Chicago and its suburbs, including Narcotics Anonymous, Cocaine Anonymous, Marijuana Anonymous, SMART Recovery, and Refuge Recovery. Take advantage of living in a major metropolitan area and seek out support from any of these groups. I also recommend that you track your urges in a log, noting the people you are with, what your mood is, what time of day it is, and where you are when you experience them. There might be a pattern to emerge from tracking urges which could further inform your relapse prevention plan. I suggest sharing this with members of your support system, whether it be a home group, a sponsor, a peer in recovery, or your therapist in order to further heighten your awareness of your cravings, urges, or triggers to use. Recovery might be the hardest thing you do in your entire life, so put yourself in the best possible position to succeed. Whatever you do, do not isolate and do not despair. 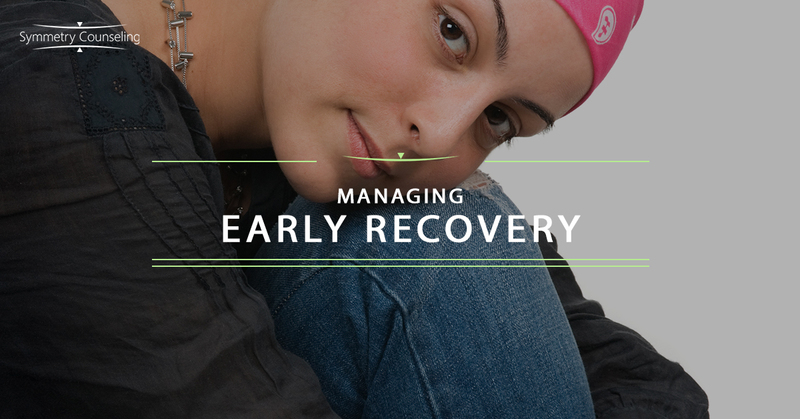 Recovery is difficult, especially early in the process, but if you work the 12 Steps and/or the SMART Recovery program, your chances of success will increase significantly. Do not let a lapse turn into a full blown relapse. Regardless of how you conceptualize addiction, at some point on the way to relapsing there is a personal choice made, and you can always choose to not drink or use, even if you have already chosen to take a drink or a hit. You have hope and are motivated to change, otherwise you would not be successful in your early recovery. Symmetry Counseling has many addictions specialists on staff. If you would benefit from additional support in your recovery, contact us today.